I thought that Saturday, the 21st of October would be a bad day, but luckily, something made my day. Why would Saturday be a bad day? 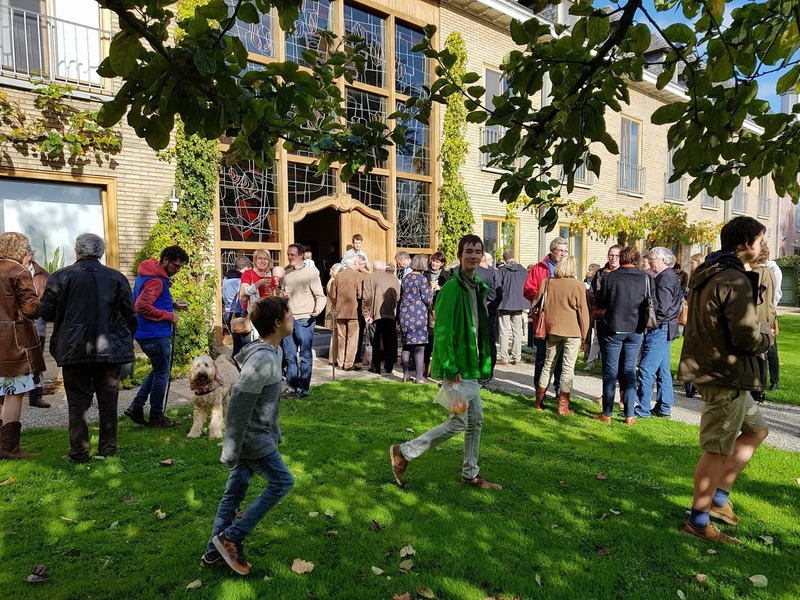 Because my children and grand children, my brothers and sisters and my nieces and nephews with spouses/companions, my cousins with their offspring and many more relatives from other sections of the family were gathering in Westvleteren and I couldn't attend! Does Westvleteren ring a bell? I tell you in a moment. The weather forecast for last Sunday was bad so I went swimming on Saturday, before the water gets too cold to be enjoyable. You know already I like to snorkel. I look out for places with weed and stones because there house the fish; lucky me, there was an abundance of tiny colorful fishes, like sardines but really tiny, baby sardines, maybe 2 cm but with brilliant greens and blues and silver; and then I found bigger fish, some 15 cm in length, about 5 of them circling around. I started following them and then I saw that on 1 fish there were mollusk like things clinging to its side! You know those red snails, without a shell, slugs,who get fat on your vegetables in the garden, they looked like them but then in a silver color. That fish was carrying parasites! I followed that fish for a bit to get a good look at the parasite and saw there were two of them. Yes, it was worth the cold sea. I had left my clothes on the beach and when I came out of the water, a Labrador was guarding my clothes. I have been very angry at this dog because he barks a lot, and continously; and I have yelled at him to shut up and there he or she is, guarding my clothes. Isn't that sweet? This and the fishes made me feel a lot better that day. Now what is Westvleteren? It is known for 2 things: the trappist beer Westvleteren and the abbey Sint-Sixtus in Westvleteren, Belgium, where the beer is brewed! It has been rated as best beer of the world by Ratebeer, can't remember the year and couldn't find it on the internet. Why would our family gather or better get invited to this abbey? Because my grandmothers name is Marie Thèrése Lebbe and every year in October the trappist convent of Westvleteren celebrates the Lebbe family! But why? Because my great great great grandfather, Jean Baptiste Victoor Lebbe is at the roots of the convent. In 1814 he went living as a hermit in the woods of his estate. In 1831, monks of the Catsberg, a cistercians abbey in the north of France, (if I recall well, there was a disagreement between the monks) heard of this hermit and settled next to him and there was a new cistercians monastery born. Later the adopted son or step son donated the woods to the monastery. 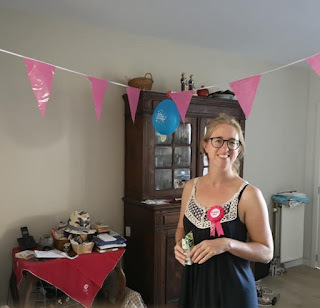 My sister Mieke told me that there was one condition for the gift: "every year a celebration should have place for the family followed by a meal". At this point, the story told by my family and the story told by the abbey are a bit diverging. Since then the monks commemorate annually the Lebbe family. The celebration in the chapel has place and seen that the family Lebbe has become rather numerous, the meal has been replaced by a reception. We get treated to the worlds most famous beer à volonté! in big 1 liter pitchers! 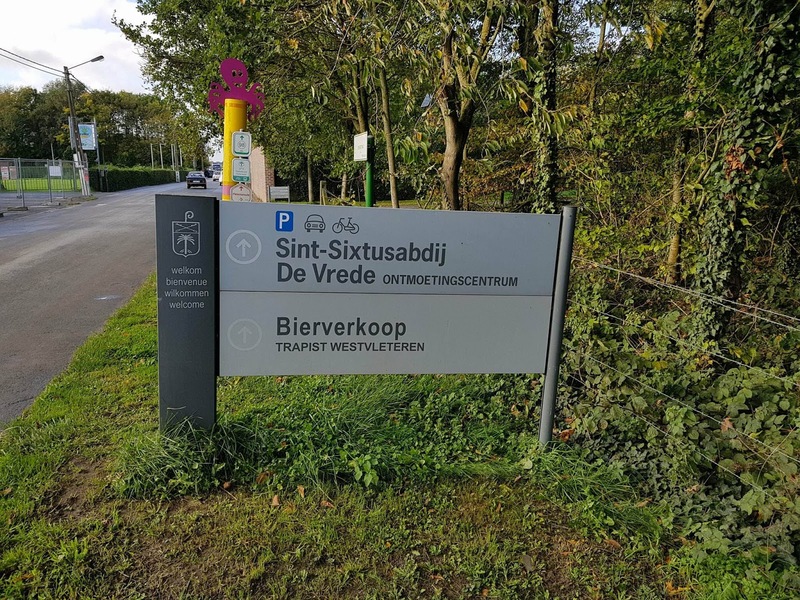 Can you imagine: the whole of Belgium has to make an appointment to buy the beer because the abbey brews not more than X- liters and they only sell it locally and we get it offered by the liter. But as I said, I couldn't attend (and couldn't take pictures). I have a small anecdote to tell you about Sint-Sixtus in West-Vleteren: from time to time my father went to visit the abbey. When I was small, maybe 8 or 10 years, we went to visit the abbey by bicycle: my father, my eldest brother Jo, my 1 year younger sister Lieve (see my first post) and me. It is a trip of 6.5 km. We children were all happy to visit a real trappist abbey! 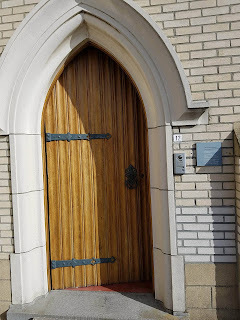 We are before the front door, my father pulls the bell, a monk opens the door, they talk together and then my father and my brother enter and when inside my father says: you girls can't come in, girls, females not allowed!!!! Can you imagine! We waited for the whole time outside on the street!!! Door where we waited. Photos courtesy of Lis & Fred Vaessen. My time is still restricted because of the olives, the walnuts, visitors... on this side not much new. I still had some snake head clasps in different colors and hadn't used them because it is so hard to decide which color of snake head goes with what color of leather! I have spent at least 2 hours altogether on deciding! I chose a purple leather for the pinkish snake head; funny, next to the purple, it doesn't look pink any more! Yes, color is a chameleon! Made by LoveLea: purple leather bracelet with snake head clasp. the same color as the olives we picked! And the yellow metal Tibetan dragon goes well with white leather! Look at my stitching, isn't it beautiful? Yes, the same white leather they told me I wouldn't be able to handle! By next week, the other ones probably will be made. When shelling walnuts you can do a lot of thinking: Christmas and New Year are coming, maybe I should design some special jewels, fancier or some small objects like a card holder, a coin purse. It can't be just another card holder, I should design my own holder or coin purse, maybe participate in a x-mas market, that would be fun! Be sure you get to see what I'll design for the festivities! Sign up to get my new posts in your mailbox! You can get all this bracelets in my fb shop; the link to LoveLea is in the left column, beneath the heading "pages".